Fry Pans offered by us are ideal for frying, searing, and browning foods. 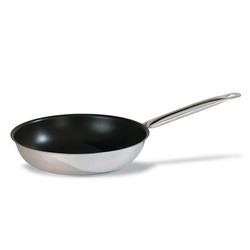 Our range comprises of stainless steel fry pan and fry pan with non-stick coating. We have gained expertise to offer an exclusive range of Stainless Steel Fry Pans to the esteemed customers. Manufactured using high-grade stainless steel procured from the trusted sources, these fry pans are made available to the clients in varied sizes, grades and specifications. Moreover, fry pans offered by us are widely used for cooking purposes in restaurants, pantries, personal kitchens and others. We have been widely appreciated in the market for offering an exclusive range of Non-Stick Fry Pans to the clients, as per their requirements. The entire range of fry pans offered by us is widely known for its ability to cook food with the use of minimal fat or oil. 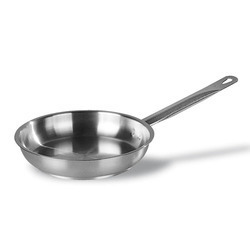 Moreover, the food sauted or fried (cooked) in these fry pans does not stick on the bottom or sides of the fry pans. Looking for Fry Pans ?